I think it's fair to say that this restaurant in Sighnaghi is special. The panorama is breathtaking. On clear days you can see the massive Caucasus mountains rise in the horizon. 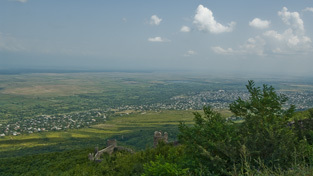 Sighnaghi lies high above the flatland in Kakheti. capture on a photo. It just has to be experienced live. 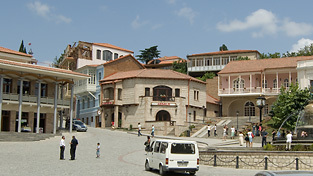 As a focus point in Georgia’s rapidly developing tourism, the city is in danger of being to commercial and smooth. I however think they managed to avoid that. There are a lot of Russians and German tourists visiting Sighnaghi, but it’s the Americans that have invested in hotels and infra structure. Partly through USAID funding. 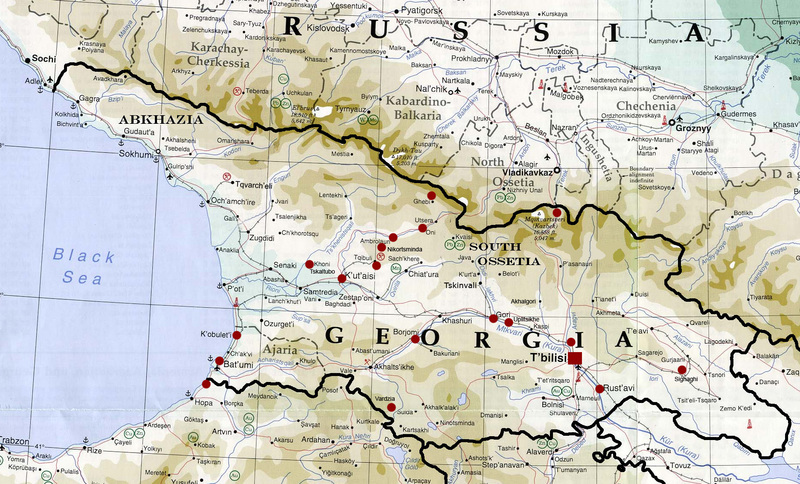 Sighnaghi served as the crossroads for trade and communication throughout the country. In the 20th century Sighnaghi has been known to many artists and poets, partly because Nikos Pirosmani comes from this area, and of course due to the stunning scenery. 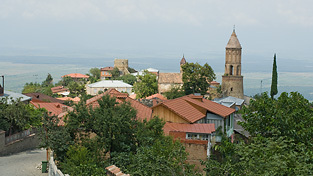 Sighnaghi has always served as an important port of Georgians history. Still the city had no real political or strategic value, so invading armies left it alone. Probably they didn’t feel like climbing up the steep hills worth while. As a result the wall consisting of 23 towers still exists. There are two Orthodox churches in the town itself - one dedicated to St. George and the other to St. Stephen. 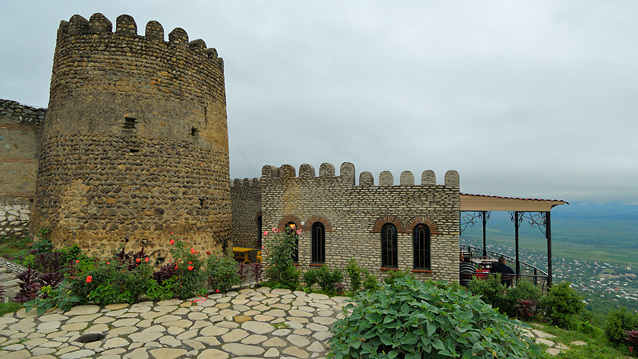 The venerated Bodbe Monastery is located 2 kilometers from Sighnaghi and is a place of pilgrimage due to its association with St. Nino, the 4th-century apostle of Georgia. The territory of the modern-day town has been settled since Paleolithic period and had been known as Hereti in Middle Ages and as Kiziqi since the 15th century. Sighnaghi (literally meaning "a harbor" in Turkish) as a settlement is first recorded in the early 18th century. In 1762, King Heraclius II of Georgia sponsored the construction of the town and erected a fortress to defend the area from marauding attacks by Dagestan tribesmen. As of the 1770 census, Sighnaghi was settled by 100 families, chiefly by craftsmen and merchants. Although the city is filled with small restaurants, I found it difficult to get a table anywhere. We finally could sit down beside a very noisy party of Georgians, shouting, drinking and throwing food to the dogs eventually circling around the table. Not what you would expect from the delicate surroundings the city offers. We left rather quickly, and I went in to a store to buy mineral water to my wife and the rest of the family. The shopkeeper looked surprised when I paid, and my wife translated him saying that this was the first time he has ever seen a foreigner buy anything for Georgians. “Here even the Georgian guides, less than poorly paid, buys mineral water for the tourists in order to be good hosts”. He shook his head and smiled, as he with the utmost chivalry and a deep bow opened the door for me. An interesting experience, indeed. I think the Georgian hospitality is a threat to the Georgians themselves. It is a part of a culture where hospitality always is returned. With tourists visiting once this is a favor that will never be returned. Sure, you can argue that tourists leave money in the country, but that’s not going to benefit the guides, the front liners. It’s the owners and big shots benefiting from that, and they don’t compensate for the expenses traditional Georgian hospitality represents for the ones serving in the front line that feel obligated to act in a traditional Georgian way. I think this is something tourists should consider when offered free gifts and services from people around. Sighnaghi Museum exhibits 16 paintings by the wolrs famous Niko Pirosmani. Pirosmani was born in Kakheti’s village of Mirzaani, therefore early period of his artistic career is affiliated with Kakheti. His paintings do not fit into the boundaries of any artistic trend. Pirosmani’s works are of special importance both for Georgian and the world art. You might also have heard about the great opera singer, “Georgia’s swallow”, Vano Sarajishvili who is born here. All in all, Sighnaghi is a place you need to visit if you go to Georgia. Kahkheti is Georgias premium wine district, and something tells me that Sighnaghi soon will have an exhibition of Georgian wine and history. Then it’s impossible to avoid going there. The pittoresque center of Sighnaghi on a steep hill. The city is beutifully restored. 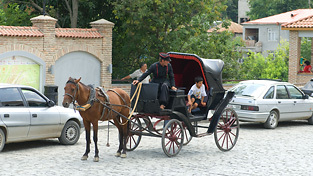 Sightseing with horse and carriage is comfortable. 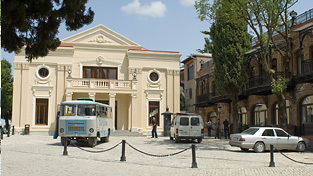 The museum holds 16 Pirosmani paintings! Go! On clear days the Caucasus can be seen in the horizon.